The Old Mission United Methodist Church sanctuary on Shawnee Mission Parkway is one of the most recognized structures in northeast Johnson County. A congregation that had its first service 75 years ago this month in the old Fairway Theatre building that today is a Houlihan’s restaurant will be marking its big anniversary this weekend. Old Mission United Methodist Church, which grew from those theatre services to complete its own small chapel in 1947 and later the stately sanctuary that sits alongside Shawnee Mission Parkway, will be hosting a family-oriented party in its parking lot at 5519 State Park Road this Saturday, Sept. 16. The party will feature food trucks, kids activities, games and inflatables. Earlier this year, the congregation held a fair to focus on service projects as part of its anniversary commemoration events. Old Mission’s first service was held Sunday, Sept. 20, 1942, and began with a communion service held in the upper room of the East Building at the Shawnee Indian Mission. 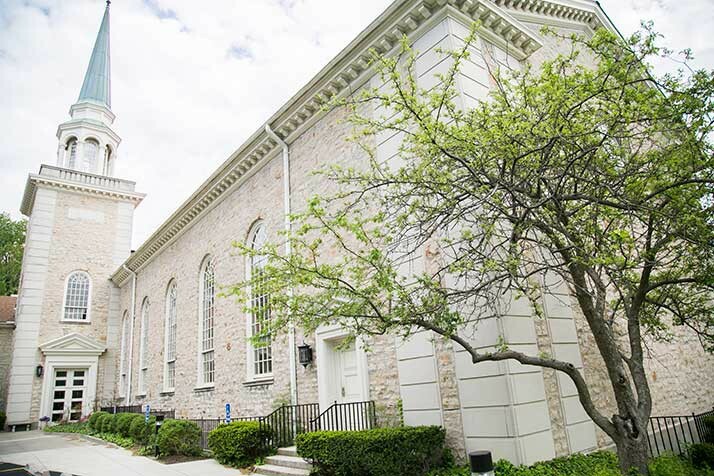 After the communion, the group proceeded to the recently opened Fairway Theatre building, where 165 attendees signed on to become charter members of a new congregation. The bible and pulpit the group used in its first worship service were the same ones used by Thomas Johnson, Johnson County’s namesake, when he oversaw the Shawnee Indian Mission.